I never was a pancake girl. Give me eggs, bacon and toast. That’s what I liked as I most often I choose the savoury over the sweet. As you can imagine, nothing bummed me out as a kid more than waking up to a stack of pancakes for breakfast. I know that for any other kid including my own, this would be a delight but for me not so much. No offense to my mother but In my opinion, these pancakes were dull, flat, dense and lifeless. The only way to liven them up with flavor was to coat them in maple syrup and a mountain of salty butter. BUT since I don’t have much of a sweet tooth, this just wasn’t happening for me. Time nevertheless moves forward, days turn to weeks, weeks turn to months, and so on and so forth. Now I’m an adult and oh, how have the times and tastes changed for me. I can’t think of anything that would put a more of a spring in my step than these pancakes. Dull and dense, they are not. 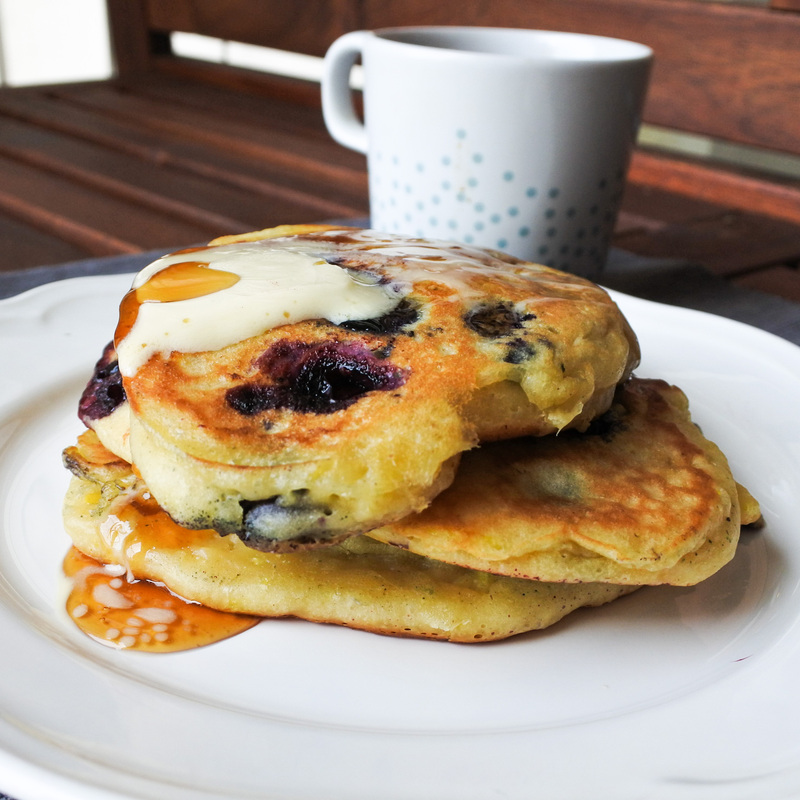 These fluffy little buttermilk silver dollars are full of life with fresh blueberries that burst in your mouth when you bite into them and bleed into dough. The tartness of those blueberries is perfectly complimented by the added depth of tangy lemon and spicy ginger. Mix together flour, baking powder, salt and baking soda together. Next, add the buttermilk, egg, honey, melted butter, lemon zest and ginger and mix together until thoroughly combined. Gently fold in the blueberries and let sit for 5-10 minutes. After 5-10 minutes, batter should be slightly bubbly. Heat a tablespoon or so of butter or oil in a non-stick frying pan over medium/medium-low heat. Add a large spoonful of pancake batter to the pan and cook until golden brown on each side. Remove from heat and serve with a dab of butter and drizzle of honey. *if you don’t have buttermilk on hand like I sometimes do, no problem! Just mix 1 tbsp of lemon juice or vinegar with 1 cup of milk, stir together and wait 10 minutes. It’s a great buttermilk substitute if you ever find yourself suddenly in need.